Inside the back of a SUV parked in Lytle Creek is a box of Thanksgiving food bound for a family celebration. Dinner was about to start roughly 35 miles away, but the drive took longer than expected because of windy cold conditions. "We came from Victorville, and we're going to Chino Hills, and it's freezing out here, and super windy, and we don't want to face the traffic going back home,” observes Andrea Terwilliger, a high desert resident. 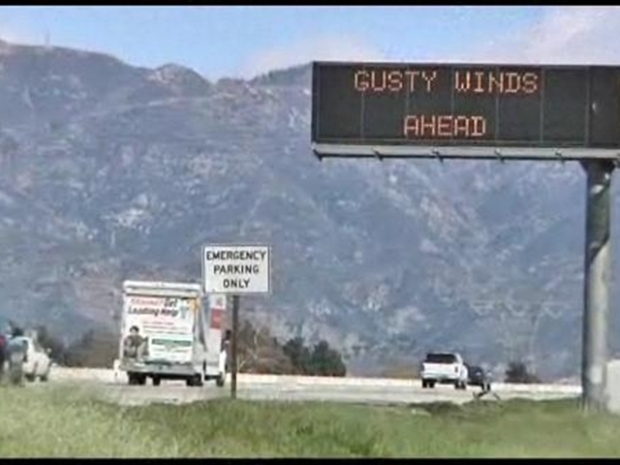 High wind warnings were posted along most Inland freeways on Thursday. The California Highway Patrol said there were few mishaps but very long delays. “We’re looking at a lot of traffic today (Thursday) because of the holiday. Northbound 15 towards Las Vegas is packed. The freeway is a parking lot. I'd like to remind motorists to just exercise some patience,” advises Officer Dale Witham, CHP, San Bernardino. Thanksgiving dinner may have warmed the soul, but it was a different story outside as ole' man winter blasted Southern California. Patience and skill in maneuvering through heavy traffic, as Shaun Adamson learned. "It's just cold, chilly wind. Super windy on the freeway. (The Driving) is rough. Blowing me all over the place,” according to Shaun Adamson, Chino Resident. "I think that it’s really windy today on the first Thanksgiving Day of the week, today, according to Alyssa Adamson, six-year-old traveler. "I'm looking forward to getting there.